Both as a photographer and an ecologist I am regularly wowed by valley oaks (Quercus lobata). These comely giants rise up from the driest summer soils and produce a rich refugia for hundreds of plant and animal species avoiding the unrelenting sun. These trees create veritable oases of wildlife and wildflower activity in a desert-like August sun. Unfortunately these giants are perishing with limited replacement. As the parent trees pass on, quality habitat for regeneration also desiccates. The fathers and mothers have seen our land shift from native American management to agro-industrial conversion. Rare trees still grow in large groves with mingling arch-like crowns. Instead they are often solitary sentinels. Listen for echos from a quieter 1800, or even a 1700. We as humans can and must metamorphose nostalgia into restorative action. We can start to replant our valley oak spreads, but we must do it while they still have the soil, water and biotic conditions to establish. 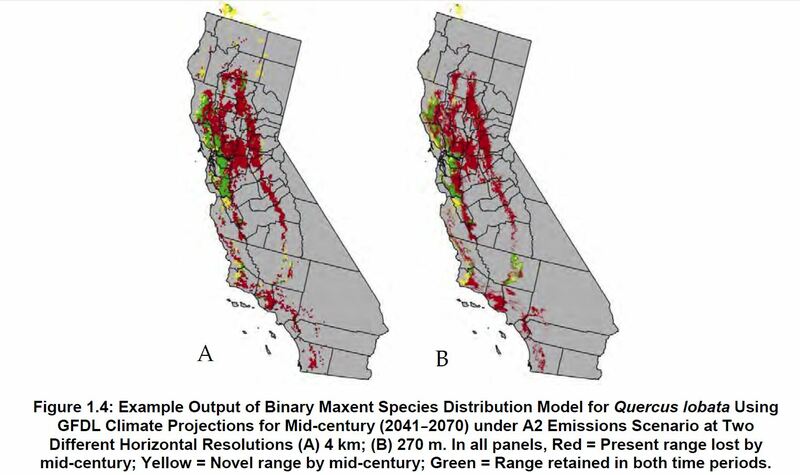 The figure below from a 2012 CA Energy Commission report models a loss of 2/3 of the extant habitat in light of rising carbon emissions and climate change. These trees are resilient when they are established, but that needs to happen soon, before it’s cost prohibitive and ecologically nearly impossible. 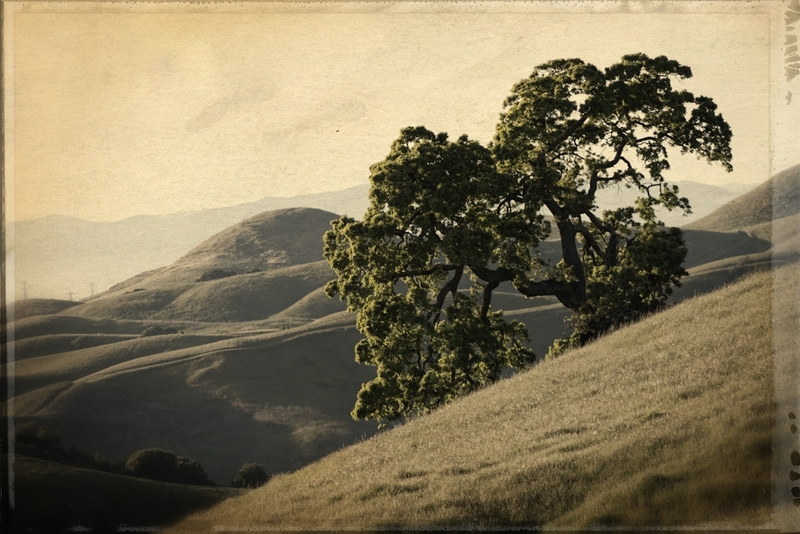 We hope to get a small planting going in a historic valley oak area through Golden Hour Restoration Institute. We do need money (about $2000) and partners and I hope we can play a small role in helping maintain the grandiose valley oaks of our fathers grandfathers past. 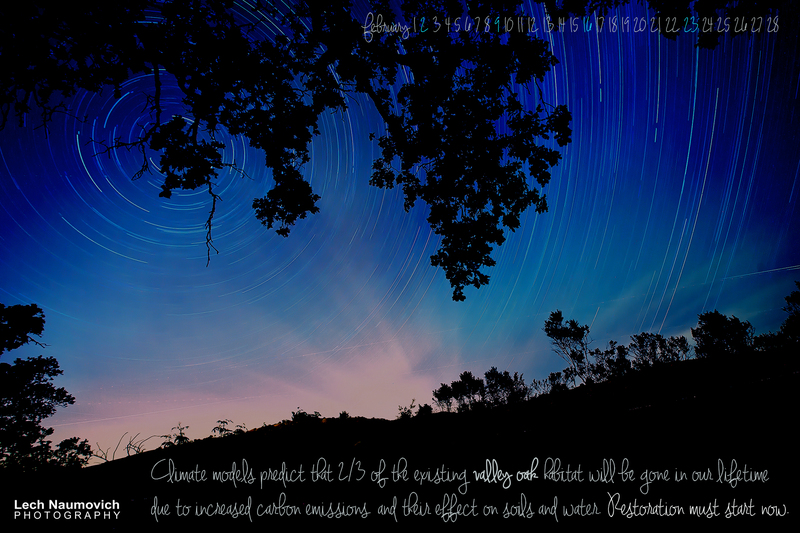 The following calendar shows star trails behind a massive, silhouetted valley oak in Joseph Grant County Park in Santa Clara County. I hope you enjoy it as a desktop for February. Here’s the full-sized image for download for desktop use.